Established in 1986, Advanced Refrigeration & Air provides commercial refrigeration installation and service to grocery stores, restaurants, warehouse clubs and other food-related businesses. It is the industry leader in the southeastern U.S. and has seven offices, a fleet of 150 vehicles and over 200 employees servicing customers throughout Florida, Alabama and Georgia. In addition to Publix, its customers include other large-chain clients like Target, Costco, Restaurant Depot and Crispers. 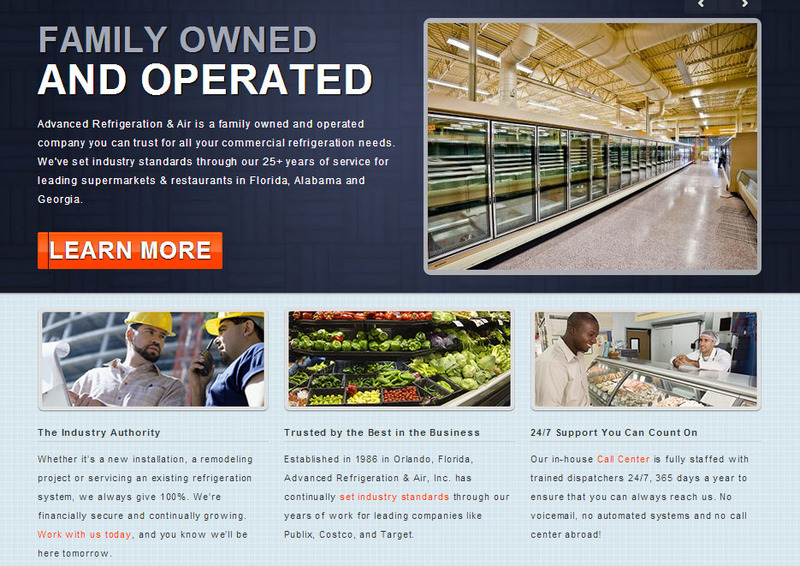 Despite its impressive credentials, Advanced Refrigeration & Air had an outdated website that made it look like a small, insignificant company. The website was an ineffective marketing tool for the company, which instead relied on its reputation and word-of-mouth to get new business. Susan Greene, marketing copywriter, worked closely with the marketing director at Advanced Refrigeration & Air to build a new website that told of the company’s impressive history, extensive capabilities and dedicated workforce. The new website became the company’s most effective marketing tool. It rose to the top of the search engines and soon began bringing in new business inquiries. The company found it also helped attract quality employees, which they were always seeking. Based on the success of the website, Susan Greene was asked to also work with the company in writing a corporate video that salespeople could use in introducing the company to prospective customers. I am very excited to get the corporate video and website completed. Thank you for all your help with everything. It has been a real pleasure working with you. You did a wonderful job on everything, and everyone has been really impressed with your work. You definitely exceeded our expectations. Thought you would like to know that when Matt Thurman [president] read the website copy for the first time, he couldn't stop talking about how you did such a great job! I will be sure to contact you for our next project. Advanced Refrigeration & Air, Inc. Does your website accurately portray your business? Let’s talk about your website project.